Tag: dreaming | I Love Lucid… Dreaming! It might seem a little strange to consider that you have more than one identity at first, but when we look at identity we realize it’s not a fixed thing anyway. Are you the same person you were yesterday? What about five years ago? As we see, identity changes over time. When we make the transition from waking to dreaming, we also transit from our waking self to our dreaming self so that we can operate proficiently in dreaming reality. To ‘get’ this, let’s use an analogy. If you hold both hands out wide, one hand is your waking self and the other hand is your dreaming self. If you turn your head and shift your focus from one hand to the other and back, is either one ‘less you’ or ‘less real’? Of course not. Both exist simultaneously and are equally valid. So when we switch between our waking and dreaming selves, we are just changing focus. We may or may not remember we have another ‘hand’, another identity while we’re busy using the other one! And in the same way, your waking and dreaming selves are both still ‘you’. One of the many benefits of lucid dreaming is that by training our lucidity, we are opening channels between our waking self and dreaming self identities, blending them in a way that will enrich the experience of both. We are integrating into a more whole being. We bring more of the creativity and knowing of our dreaming abilities into waking life, and the sharpness of conscious focus, intent and reflection into the dream world. And in the process, we get to explore lots of new ideas and have a whole heap of fun! Is Rapid Eye Movement the same as Dreaming? What are currently recognized as dreaming periods are the REM (rapid eye movement) portions of sleep. What is generally not known however is that we dream and have other experiences at deeper levels of the psyche that aren’t usually fully consciously remembered. Some of these are formless or imageless interactions. The information and experiences we have on these levels is translated into dream imagery at levels closer to our waking consciousness, and this is what is recognized as REM dreaming. In other words, we still dream in non-REM periods, but these dreams are trickier to remember directly the deeper we go, because there the information we receive is usually too vast for our conscious minds to contain. So we translate it in symbolic form through the image-laden medium of REM dreams. And yet, as we stretch our dreaming attention and conscious capacity, we are more likely to remember more information from these levels, which is more akin to a direct knowing. The confusion that REM periods and dreaming periods are exactly synonymous is one that has come about through the scientific study of dreaming from outside observation. 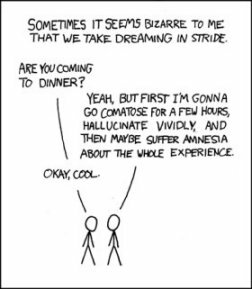 But by recognizing that REM is associated with the scanning of dream imagery, it is easier to see that those non-REM periods of sleep are not necessarily ones of ‘unconsciousness’ but quite the opposite, they are periods of superconscious activity that escape our conscious focus, imageless ‘dreams’ of a magnitude that is mind-blowing to glimpse!